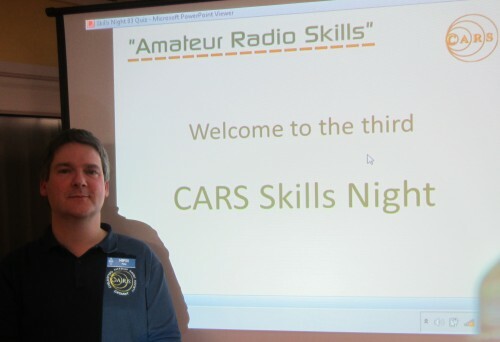 The third Skills Workshop held by the Chelmsford Amateur Radio Society took place last night on the 17th of March 2014, giving local amateurs the chance to chat and try something new. The events are put together based on feedback from attendees, and one of the most commonly-requested items was Soldering / Construction. 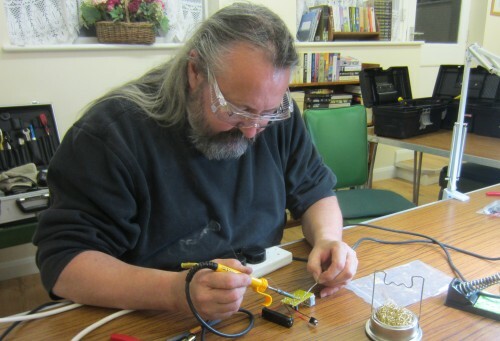 Thanks to David M0HBV and Chris G0IPU for hosting this part of the evening and allowing people to have a go at soldering for the first time, as well as get an introduction to surface-mount construction. 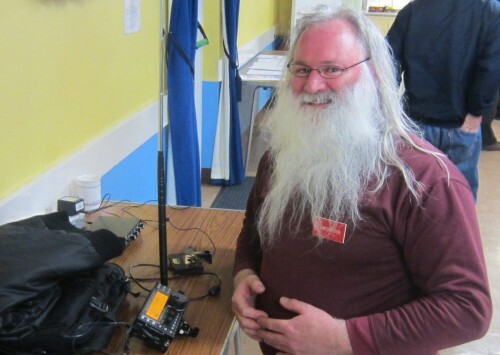 It’s so good to see people turning up with antennas, rigs and bits of home-made equipment to show to others. Peter G0DZB brought along his Elecraft KX3 and antenna, and was able to receive some strong 40m signals. James 2E1GUA brought along his /P portable equipment, and a selection of microphones, books and antennas were also passed around. 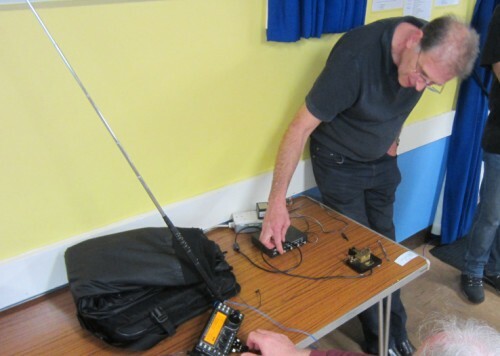 Slim Jim antennas, the easy-to-make 2m antennas, seemed to be the order of the day, being used for the Echolink demo, the Essex Ham 2m voice station, and being demoed by Charlie M0PZT. Back by popular request for a third time, Jim 2E0RMI had more queues of people looking to give Echolink a try. 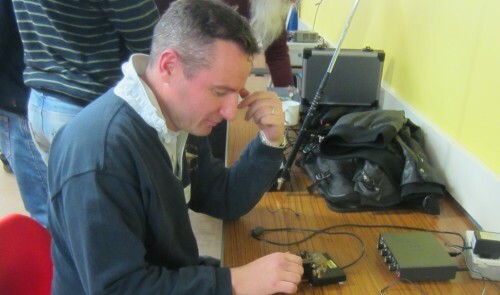 Using a combination of RF and Internet, Jim’s Echolink station was busy throughout the evening, showing Foundation licence holders that International QSOs can be had with a simple £25 handheld. Many thanks to Bruce M0XBS for showing what the spirit of cooperation is all about. 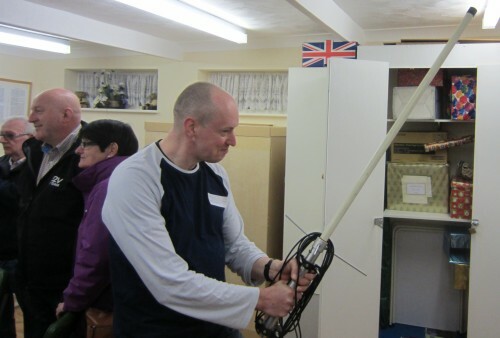 During a recent CARS training course, Bruce noted that the club’s 2m vertical was missing a radial. 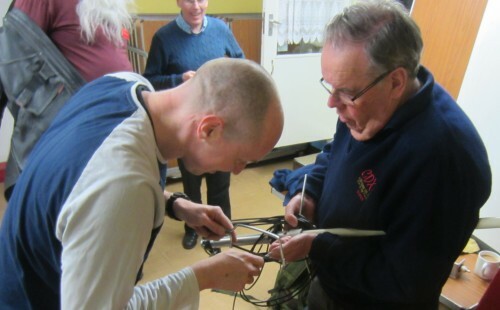 Taking the concept of a skills “workshop” literally, Bruce came armed with tools to fix the antenna, with help from G3PEM’s vice-like grip. Thanks Bruce! 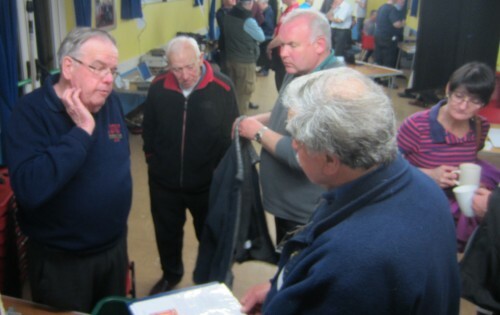 Thanks to Steve G4ZUL and others from the Essex CW Club for coming along with some demo kit – CW QSOs were quietly wafting across the hall on-and-off throughout the night, making the event feel like a Morse contest at times, and it was good to see a few friendly faces picking up the paddle to get in some practice. Thanks to Carl G3PEM for returning to offer his antenna expertise – Armed with various accessories and a trusty whiteboard, Carl was able to help with a range of antenna questions – not only for those looking for advice on getting started with HF, but also for M6s looking to make the trip to GB3DA out in the fringes on low power. Trialled last month, the quiz returned with a series of questions from Clive G1EUC and Murray G6JYB. 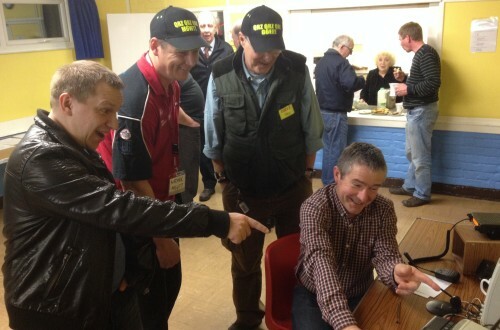 Well done to Trevor M5AKA for spotting the “deliberate” mistake! 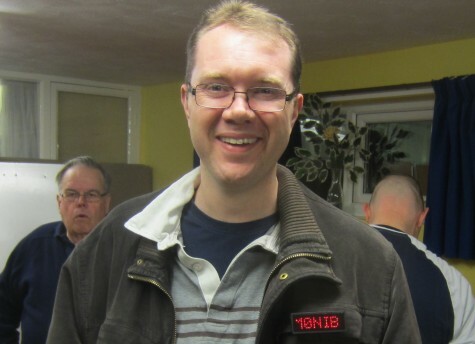 Following a successful demo of PSK31 by Charlie M0PZT last month, Pete M0PSX brought along a scrolling display of PSK31 QSOs recorded on 20m meters, so everyone could see what traffic has been sent earlier in the day. 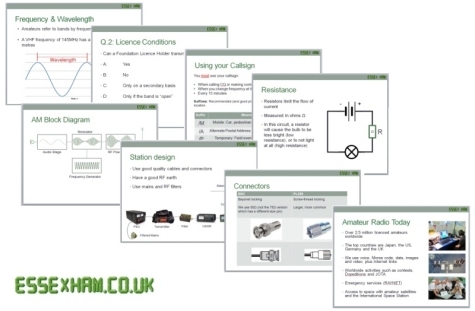 Pete took the opportunity to explain the basics of data connectivity using his Digimaster Pro CAT/Data interface. James 2E1GUA’s interface was also on display on the show-and-tell table throughout the evening. 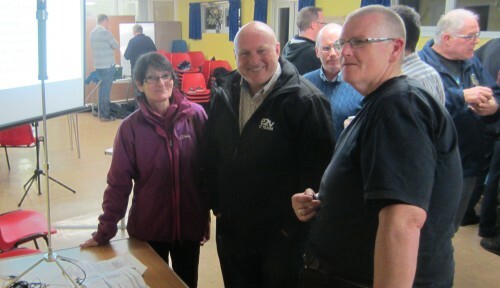 Thanks to everyone who turned up – we had 38 people at this session, which is great. 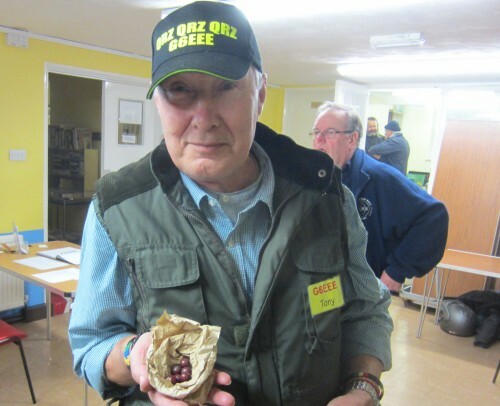 Thanks also to those who brought stuff along, and to the evening’s helpers, notably: David G3SVI, Myra M0MYR and Ann (Mrs 2E0RMI) for the excellent work on the evening’s refreshments (tea, cakes, and for the chosen few, some posh coffee!). 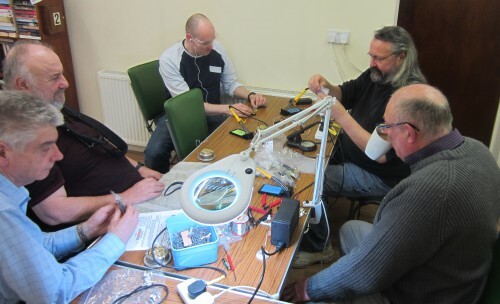 Thanks to the Essex CW Club, David M0HBV and Chris G0IPU for the hard work in setting up the soldering demo, and to everyone else who helped to make the evening a success. May the Bruce be with you! Date for the diary is Monday the 21st of April 2014, which is Easter Monday.